The Elizabethton office was in the original Medical Care office. In 1987, Dr. Arnold Hopland purchased the Green Tree restaurant on Elk Ave. The building was gutted and moved over a new full basement. 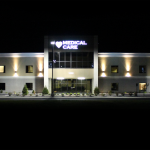 The building doubled in size and A.H. Family Medical Care was born. 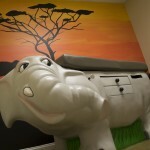 The office was expanded in 1997 adding four additional exam rooms. In 1998, the current waiting area was built. In 2000, a new two-level addition was built – it included ten exam rooms, four bathrooms, Lab, office space, and a second entrance and waiting area. But in order to expand our horizons even farther, we needed to expand again. Instead of following suit with our past, we decided to go big. In 2011, we purchased and started remodelling the old Inland Container factory just down the road from our original office. In July of 2012, we officially opened our office doors at 1500 West Elk Avenue. The new building boasts 122,000 square feet of floor space with 40,000 square feet being used by the new office. The name was shortened over the years from A.H. Family Medical Care to Family Medical Care, and finally to Medical Care, PLLC. 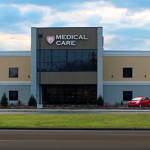 The office has thrity-one exam rooms, nineteen bathrooms, two waiting areas, radiology department, lab, and is located on the west side of Elizabethton on Elk Avenue (also known as Hwy 67 and Hwy 321). The office houses our administration, records, referrals, radiology, and lab.